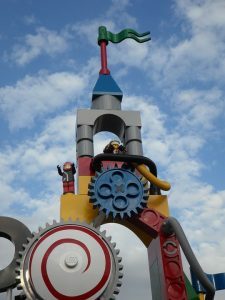 While there is fairy Lego, boys and girls do not need the special pieces; they can have fairy Lego fun as they build and imagine with any of it. (or Duplo) For a play-of-the-day, let’s create with Lego. Besides fairies, there are trolls, gnomes, sprites, pixies, elves, dwarves, imps, wizards, witches, and other fantasy beings. Plus, kids can invent their own creatures. 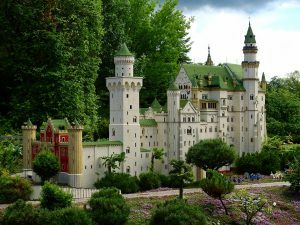 Lego can be anything, just like imaginations. *Younger hands prefer playing with the larger Lego or Duplo, but generally, it’s all called Lego. Any creature needs a place to live, something to call home. Some might live in castles, some in forests, and others in houses or caves. Because these are imaginary creatures, there is no right way or wrong way to build. Kids are free to create whatever they like. Part of the appeal of Lego is that it combines both limits and freedom. The Lego bricks have straight edges and only fit together in a certain way. However, what kids can do with these plastic bricks is unlimited. 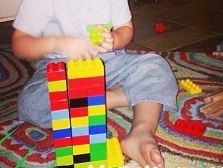 Lego and Duplo challenge kids physically, mentally, and emotionally. 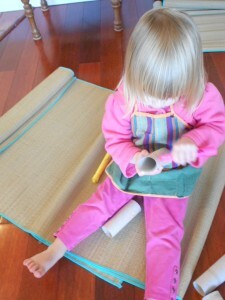 Building with bricks takes coordination of small muscles in the hands, fingers, and wrists. For the large muscles, there’s often moving around on the floor, as well as practicing keeping muscles still. Although we can’t see from the outside, brains are super busy organizing, deciding, planning, adapting, and concentrating. Emotions are in play too. When kids play with Lego, they are not only learning how to manipulate these little pieces, they are also learning to handle their emotions. They have to be patient and cope with frustration, adapting their ideas and wants as needed. Lego blocks themselves are very simple; we can recognize a piece of Lego anywhere. What kids—and adults—can do with them is complex. Kids can create something different every single time they play, or make favorites over and over. Play with Lego and Duplo doesn’t require fairy dust to have some fairy Lego fun, but it’s still magic, isn’t it? For more play ideas, check the 123kindergarten blog. The magic is PLAY. 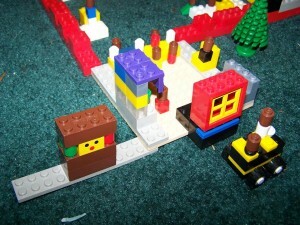 Today’s Games event is Olympic Lego activities and play. Medals aren’t given out for toys but if they were, Lego would win the gold. Lego may look like a simple, humble toy but it gets the top score for both technical merit and artistic impression. Lego scores high for artistic expression as well. It is amazingly versatile and appeals to kids—and adults. Kids have to use some basic science, like having links up a tower for stability, along with imagination. Lego can be anything: animals, dinosaurs, vehicles, buildings, trees, flowers, machines, monsters, games, people, sculptures, and food, although we can’t eat it. Kids can play with it over and over and never make the same thing twice. There is no time limit on creativity. As children build with Lego, they are also building their knowledge and skills. In order to develop the immense brain connections and pathways, children need to experiences, especially of the hands-on kind. One of the ways the brain gathers information is via the senses. 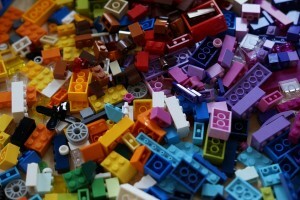 With Lego, the senses of taste and smell do not come into play, but touch, sight, and hearing certainly do. 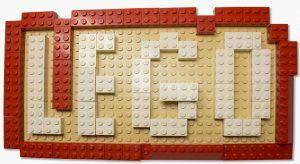 Lego is a tactile experience as fingers, hands, and other parts of the body, all manipulate the bricks. Touch sensations on the feet can be painful, though. Ask anyone who has ever stepped on Lego. All of the sizes, shapes, and colors of Lego and various creations challenge eyes. The sound of hands hunting thru Lego for a particular piece or dumping Lego on the floor is surprisingly loud. 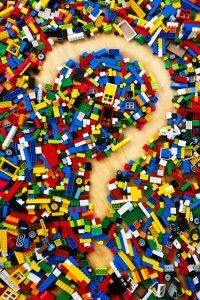 A few of the skills involved in Lego play activities include problem-solving, observing, predicting, making choices, planning, and others. There’s plenty of science and math to use and discover. 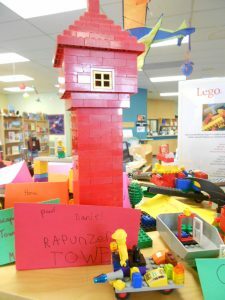 The local library in our area has a display of items kids made from Olympic Lego activities. These are photos of diving boards. There are stadiums, stairs, boats, and beaches. One child has made parts of a hotel for the people who go to watch. 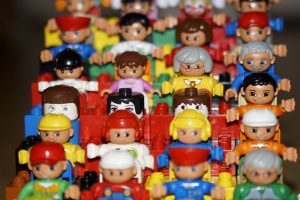 Another filled a grandstand with Duplo people. There’s a tremendous amount of brain and body coordination during play. Play is the gold medal activity for kids. Does your child play with Lego? Did you hear that 3 Lego characters traveled all the way to Jupiter? Their adventures inspire some Lego space play for today’s play-of-the-day. 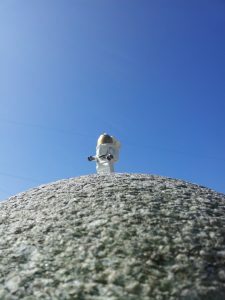 Three Lego figurines, made of special aluminum and tested for space, finally made it to Jupiter. Their journey has been 5 years and 1.7 billion miles long. While the Lego people that kids have at home is different than the ones sent into space, they can still have adventures. The only other material kids need besides some Lego bricks is imagination. Building a Lego spacecraft is quite a challenge. Older kids might really enjoy it, but younger ones may like using a toilet paper roll or other cardboard tube as their rocket. Little Sister just likes to color on the rolls. Tuck a Lego people inside the tube or roll and fold over the ends so the space traveller doesn’t fall out. Let the journey begin. Imagination is a powerful tool and strategy. Corporations search for adults who come up with imaginative ideas and creative solutions. We don’t think of imagination as a skill, but it’s something that kids can develop. They need play activities and opportunities. To rev up your child’s imagination, parents and caregivers can ask questions. These could be, “Where is your Lego going?” Talk about what the Lego people might see. Is there anyone else to meet? Kids like action. You could ask the Lego character to tell what it’s doing. 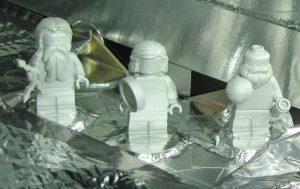 Just imagine if these 3 Lego people stay on Jupiter. They would need houses, stores, cars, food, furniture and other items. Kids can also build these. The Lego people don’t have to stay on Jupiter. Perhaps they decide to go to a different planet. Lego space play can go anywhere. In the words of Einstein, “Logic will take you from A to B. Imagination will take you everywhere.” Where will your child go?